3Play Media’s round trip integration with thePlatform provides an automated workflow for captioning, transcription, and subtitling. Your video files can be transferred directly from thePlatform to your 3Play Media account for processing. After your captions or subtitles have been processed, they are automatically sent to your thePlatform account and added to your videos. Turnaround time is specified at the time of upload and can be as quick as 2 hours. You can monitor the status of your files from your 3Play Media account. The first step is to link your two accounts. Note that you will only need to do this one time; after 3Play Media and thePlatform are linked, you can easily submit videos for captioning and subtitling at any time. Log in to your thePlatform account. We recommend creating a captioning-specific Admin user to link to your 3Play Media account, but you can choose an already existing user, as well. To do this, navigate to the left nav bar and click Account Setup > Users, then click Add. 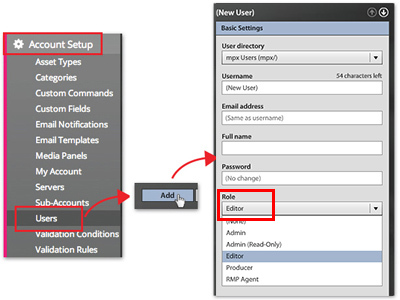 Fill in your settings, and make sure you select Editor in the Role dropdown. Click Save. Take note of your username, password, and PID. Note that your PID is the letter combo at the beginning of your User ID (either mpx or mps). You’ll need these for the next step! Note: Any videos that you want to submit for captioning must have streaming enabled. You can change the server location from the Storage Server drop down in your thePlatform account. Log in to your 3Play Media account and click the Upload button in the top left. Select Linked Account, then + New Linked Account. Select thePlatform. Enter the username, password, and PID from your thePlatform account and click Create Account. Once your accounts are linked, you’ll see that all of your videos from thePlatform appear in your 3Play Media account. From the linked account page in 3Play Media, select the videos that you want captioned. Click Upload and specify turnaround options (you can choose up to same day service). When captions are completed, they will automatically post back to your videos. You can monitor the status of your captions from your 3Play Media account. You can add subtitles in different languages to your videos from your 3Play Media account. First, set up a translation profile by selecting Translation Profile on the Settings page. Once a video has been captioned, select the file from the My Files page. You’ll see the transcript of your file. From the top nav bar, select the Order dropdown and choose Translation. Select a language (or languages) for your subtitles, select a service level, and order your subtitles! 3Play Media enables T-Mobile to meet fast approaching deadlines and deliver high quality closed captions. The support team is very responsive and show that they care about the quality and efficiency of their services. I highly recommend 3Play Media to video publishers looking for professional transcription services with a partner that is easy to do business with.